So I am always finding new little tricks to help me in the kitchen and I wanted to share some with you. 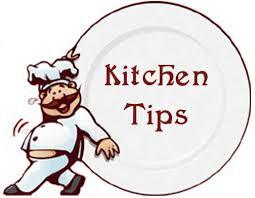 I have a list of 23 Kitchen Tips for you below. If you try and any let me know how they work for you or if you have a tip feel free to leave it in a comment. FRITTER AWAY: (recipe)Got zucchini? Make fritters! The key to making them crispy is to first lightly salt the coarsely grated vegetable and set aside in a colander to drain for 15 minutes. Then wrap it up in a clean kitchen towel and squeeze firmly to expel as much liquid as possible. KERNEL KEEPER: An easy way to prevent corn from going everywhere when you are cutting it off the cob is to use a bundt pan. Place the cob in the center, standing it up on the protrusion, and cut downward so the kernals tumble directly into the pan. JAVA JUICE: For the ultimate iced coffee, brew several cups of your favorite blend and sweeten to taste with condensed milk. Cool, then pour into ice cube trays (silicone are the easiest) and freeze overnight. Use these to chill your iced coffee and they will only enhance, never dilute. TOMATO TIME: Prolong the life and enhance the flavor of ripe tomatoes by keeping them at room temperature rather than in the fridge. Always store them stem end down. This prevents air from entering - through the cut stem. If possible, eat them within 2 days. SUMMER, CUBED: (recipe) Preserve fresh herbs, such as thyme, chives, and rosemary, by chopping them finely and packing them into an ice cube tray. Top up with olive oil, then cover with plastic wrap and freeze. The cubes dissolve easily into sauces and provide bright flavor all year long. SALSA LESSON: For a spicy, complex classic Mexican salsa. toast a handful of stemmed dried chipotles or New Mexico chilies in a hot skillet. Puree in a blender with boiling water, garlic, a little vinegar, and salt. Great on roasted meats. INSPIRED TOAST: Crostini, the Italian word for little toasts, are the perfect vehicle for a wide variety of snacks and hors d'oeuvres. Toast small slices of country bread or a baguette on the grill, in the oven, or in a skillet with a little olive oil, Then rub with a garlic clove and top with almost anything. FALL WINDFALL: A surplus of apples is one of fall's most anticipated delights. If you have got any left after making applesauce, apple pie, and apple butter, saute' or boil chunks with parsnips, squash, and carrots for a delicious pureed soup. Sweet onions and spicy ginger add even more personality. WILD BUNCH: (recipe)The sweet, musky flavor of Concord grapes males a sophisticated sorbet. Mash 2 pounds of grapes and macerate overnight with 1/2 cup of sugar. Press through a fine mesh strainer to extract the juice, sweeten to taste with agave nectar, and freeze in your ice cream maker. USE YOUR NOODLE: Did you know you can presoak dried pasta to greatly reduce the cooking time? Simply place it in a bowl covered with cold water and soak for an hour. When you are ready for dinner, drop the soaked pasta into a pot of boiling water and cook for about a minute. HARD BOILED: (recipe)To make perfectly boiled eggs with firm-tender whites and just-set yolks, start with room-temperature eggs and a saucepan of boiling water. Gently lower the eggs into the water and cook for 8 minutes. Transfer to an ice bath for 5 minutes before peeling. WHEY TO GO: When you make fresh ricotta by stirring lemon juice into just-boiled milk and drain the lightly salted curds using cheesecloth, you get not only the fluffy cheese but also the pale yellow liquid called whey. Full of probiotics, it can be combined with honey and lemon juice for a delicious, healthy drink. WORTH YOUR SALT: (recipe) A killer seasoned salt is a secret weapon for your pantry. Combine smoked salt, ground black pepper, smoked paprika, English mustard powder, onion powder, garlic powder, and light brown sugar for a blend that adds a hint of smoky bacon flavor to everything from scrambled eggs to grilled peaches. SWEET TREAT: (recipe) For a deliciously nutty chocolate confection, stir together 2/3 cup Nutella, 1 2/3 cups melted dark chocolate, and 2/3 cup roasted slivered almonds. Pour into a silicone loaf pan, sprinkle with more slivered almonds, and refrigerate until firm. Slice into small squares and serve. FRESH SPROUTS: Discover the unexpected joys of Brussels sprouts served raw in this delicious salad. Shave the sprouts very finely - use a mandoline if possible - then combine with chopped walnuts, slivered red onions, lots of grated Parmesan, and a pungent dressing of lemon juice, mustard, and olive oil. UPPER CRUSTS: (recipe) Transform your stale bread into delectably seasoned breadcrumbs for garnishing salads, soups, and pasta. Place dried-out bread in a ziplock bag, wrap in a dish towel, and crush into crumbs with a rolling pin. Saute' in salted butter and olive oil with herbs and chile flakes until golden brown. TALKING TURKEY: If you have never deep-fried your Thanksgiving turkey, this could be the year! All you need are 4 gallons of peanut oil, a turkey fryer or a very deep stockpot, and a brined turkey. It takes just 3 minutes per pound to cook and it emerges crisp-skinned and wonderfully succulent. FLOUR POWER: Infuse your holiday baking with more healthy nutrients by swapping out some of that white flour. Try substituting 1/4 to 1/2 cup with finely milled whole wheat flour, oat flour, or teff flour. You can also add more fiber with up to 4 tablespoons ground flaxseed. WHIP IT GOOD: A surefire way to guarantee that your egg whites whip up properly is to always clean your mixing bowl and whip attachment with white vinegar before storing them. This removes any trace of fats, which can prevent egg whites from attaining those essential peaks. GO NUTS: (recipe) This addictive snack is ideal with champagne or an icy martini. Combine 5 cups roasted mixed nuts with 2 tablespoons melted butter, 1/4 cup chopped fresh rosemary, and 1 tablespoon each dark brown sugar and coarse sea salt. Serve warm by heating in a 300*F oven for 10 minutes. SIMPLE FINALE: We are so inundated with rich foods during the holidays that it can be a nice change to end a meal without a heavy dessert. Instead, set out a bowl of refreshingly tart clementines, a bowl of walnuts in the shell along with a nutcracker, and a big wedge of blue cheese. PARTING GIFT: Make any celebration more memorable by sending guests home with a favor; something homemade is especially gracious. Some pretty ideas: a jar of preserves or granola, a bundle of dried herbs, or a little burlap bag of mulling spices for wine or cider.